ÖBB, The Austrian Federal Railway Company, transports approximately 183.3 million passengers and 90.6 million tons of freight traffic per year. The ÖBB railway network consists of approximately 3,600 kilometres of main railway lines and in the region of 2,200 kilometres supplementary network. At the moment, the maximum line speed is 200 kilometres per hour. This will increase to 250 km/h in the near future. The maximum axle loads are approximately 22.5 tons and the total length of our tracks is 10,500 kilometres. 7,100 kilometres of them are electrified and the network contains about 16,700 switches and crossing units. ÖBB, The Austrian Federal Railway Company, transports approximately 183.3 million passengers and 90.6 million tons of freight traffic per year. 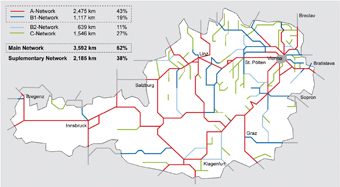 The ÖBB railway network consists of approximately 3,600 kilometres of main railway lines and in the region of 2,200 kilometres supplementary network (Figure 1). At the moment, the maximum line speed is 200 kilometres per hour. This will increase to 250 km/h in the near future. The maximum axle loads are approximately 22.5 tons and the total length of our tracks is 10,500 kilometres. 7,100 kilometres of them are electrified and the network contains about 16,700 switches and crossing units. The result of this detailed investigation was that for use in the network of ÖBB, the ÖBB/Porr ballastless track system fitted best. Furthermore, it has been established that the main field of use of the ballastless track system are on tunnel-lines. Due to these facts, only the ÖBB/Porr system has been used in the network of the ÖBB after 1995. For switches and crossing areas, special ballastless systems consisting of booted monobloc sleepers were developed and are still in use now. At the moment, approximately 130 kilometres of ballastless track systems are under operation within the ÖBB railway network – used mainly in tunnels but also on bridges and on surface lines. For noise and vibration reduction, many of these systems are combined with floating slabs. The system is tested for a maximum train speed of more than 300km/h and has a certification for a maximum train speed of 330km/h. 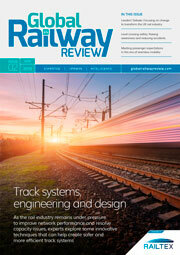 The system is licensed for use in the Austrian, German and Swiss railway network. The development of ballastless track systems started in the second half of the 20th Century in Japan (due to high speed train traffic). A few years later, these developments reached Europe. The Japanese developments focused on precast elements, but the developments in Switzerland were based on booted sleeper systems while in Germany, the developments were based on monolithic cast in place systems. The worldwide distribution of the main ballastless track system is shown in Figure 2. Due to the very good experiences gained by ÖBB with the ÖBB/Porr Slab Track System, many other railway companies showed interest in the system. Therefore, this ballastless track system has been used at new, large railway connection projects in Berlin: North-South intercity railway connection and East-West connection near the Lehrter Bahnhof. In total, there are approximately 18 kilometres of the ÖBB/Porr ballastless track system currently under operation. The system is situated in tunnels and on bridges with short sections on earthwork. The ÖBB/Porr system was designed to replace the typical behaviour of the ballasted track by several elastic elements in the ballastless system. The typical behaviour of a ballasted track shows the elasticity in the ballast itself and in the rail fastening system. These two elastic elements have to be copied by the elasticity of the rail fastening system in the ballastless track and of the elasticity of a second layer which is situated at the bottom of the prefabricated slabs. 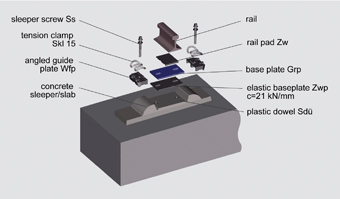 This system (shown in Figure 3) leads to a distribution of the elasticity between the elastic coating of the slabs and the rail fastening system of 10% to 90%. Usually, the rail fastening system IOARV 300-1 from Vossloh realises the needed elasticity in the rail fasteners. The elastic coating consists of a PUR-bound granular rubber. Today, the situation of the Turkish federal railway company, TCDD, shows the following statistic performance (source: www.tcdd.gov.tr): 8,700km main lines, 11,000km total network, about 8,000 units switches and crossings. The maximum line speed is V = 140km/h at the moment. The yearly transportation volume is approximately 77 million passengers and in the region of 20 million tons of freight traffic. A lot of additional railway lines would be needed to reach a similar density of railway network and furthermore a lot of improvements of the existing network would be necessary to enlarge the transportation volume of the net. Especially the differences in the number of switches and crossings are an indicator for the improvement needs of the existing network. At the moment, and in the near future, a couple of new high-speed railway lines will be built in Turkey. The maximum line speed of these projects is up to V = 250km/h. Therefore, questions of superstructure are of major importance. Not only in tunnels but also on viaducts, ballastless systems lead to economic (especially in order of long-time aspects) and safety advantages. 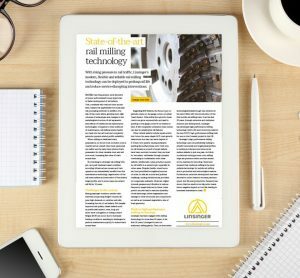 Due to the advantages of the ÖBB/Porr system described in this article, in theory it seems to fit very well for the Turkish Railway network. Especially for use in tunnels, which is the main area of application, seems to be effective as well as in Austria. The reasons for that are the much reduced maintenance necessities, the safe run of the trains and the good behaviour of the system in case of derailment events. Furthermore, it is possible to equip the ÖBB/Porr system with a lot of optional elements. For example it is possible to make the whole system rideable for road vehicles (e.g. fire engines, ambulance) by using additional elements. To increase the safety of railway tunnels, this field of usage gets more and more important in Austria. As mentioned above, the system is well suited for combination with noise and vibration attenuating systems (floating track slab systems). The basic characteristic of the system – most of the construction work takes place in pre¬fabrication sites – makes it useable with a minimum of high-qualified people on site and ensures a very good track quality. Nevertheless, most of the works for the system can be done by local people either in the prefabrication process or on site. The ÖBB/Porr track system can be combined with usual high-elastic rail fastening systems as for example IOARV 300-1 from Vossloh. At the moment, and in the near future, the Turkish railway network will be enlarged and improved. 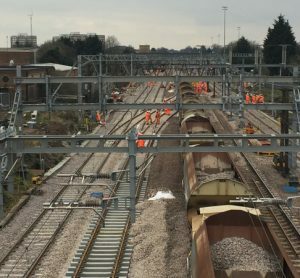 Therefore, ballastless track forms will be needed as well. 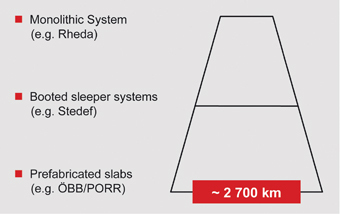 The ÖBB/Porr system for ballastless tracks which consists of elastically supported precast concrete slabs is very well suited for the specific situation in Turkey. It shows a lot of advantages for applications in tunnels, on bridges and on surface lines. Due to the prefabrication principle, a very good track quality can be realised with a minimum of high-qualified people on site. Rudolf Schilder has a diploma in Civil Engineering from the University of Graz, Austria. He also worked there as a university assistant in the Institute of Railway Technology from 1979 to 1983. During these years he received a Doctors degree in Technical Sciences. In 1983 he joined Austrian Federal Railways and occupied several functions. In 1996, as head of Track&Structure Department, Mr. Schilder was in charge of Track Technologies. Since 2005, Mr. Schilder has been Head of Permanent Way Department at ÖBB Bau AG. Mr. Schilder is a member of several national and international working groups, such as OeNorm (Austrian Standardization Office), ÖVG (Austrian Society for Traffic and Transport Science, Working Committee on Railway Technology), CEN (Committee for European Normalization), UIC (International Railway Union), AEIF (European Association for Railway Interoperability) and ERA (European Railway Agency). I am interested on the BLT application. Due to various BLT systems are available. Please give me an advice on the suitable BLT in Tunnel for medium speed train (passenger &goods). How and what are each OBB-PORR slab rebars (armature) arrangement? Is there any details available?